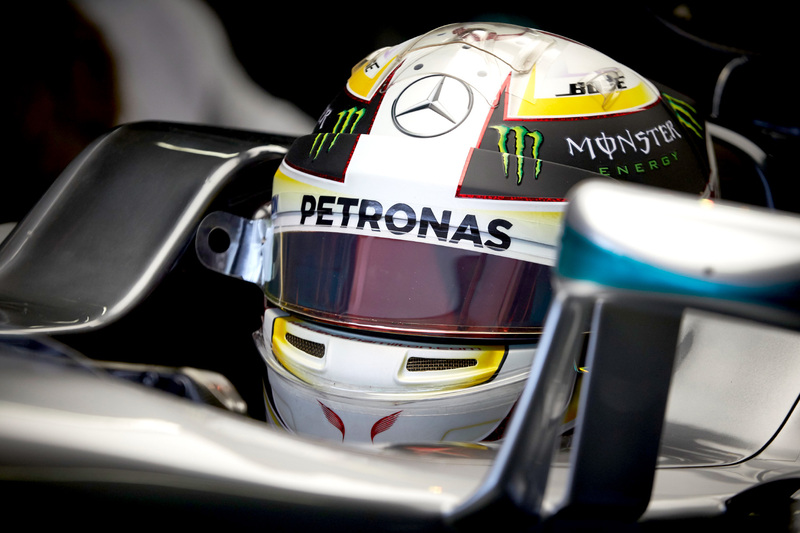 Lewis Hamilton dominated qualifying at the Mexican Grand Prix to take his tenth pole position of the season. The Briton has been on a roll since the United States Grand Prix last weekend, and a hapless Nico Rosberg, who has been off the pace all weekend around the slippery Autódromo Hermanos Rodríguez, eased his passage to the front of the grid. Lewis Hamilton’s title defence could come to an end this weekend if he finishes tenth or lower and his teammate wins the race, whereas a sustained winning streak could take the fight to the last round of the season. The gap between the Mercedes pair was 0.254 seconds after a last-gasp lap from Rosberg put him past the Red Bull Racing cars, which threatened to demote the German to the second row. Mercedes’s Niki Lauda explained the world championship leader’s struggles were down to him being unable to find the balance in his car, which hampered his ability to warm his tyres. “I took a bit longer this weekend to find the way with tyre temperatures, being on the cold side this weekend,” Rosberg confirmed. “But I got there in the end, so that’s okay. “I put it together when it counted at the end. I’m relatively pleased with that, to definitely make sure I’m on the front row. Max Verstappen led Red Bull Racing teammate Daniel Ricciardo by 0.08 seconds, the pair 0.350 seconds off Hamilton’s headline time. Two-tenths of a second separated the Bulls from Nico Hülkenberg’s Force India, who split the leading quartet from the Ferrari cars, which threatened to play a major part in proceedings based on practice times but couldn’t deliver on the day. Kimi Räikkönen qualified sixth to shade Sebastian Vettel by 0.005 seconds at the scene of the German’s worst race of 2015. Valtteri Bottas led Williams teammate Felipe Massa with an enormous half-second advantage, while Carlos Sainz dragged his underpowered Toro Rosso to tenth on the grid. The regular top-10 runners threated each other with alternative tyre strategies by attempting to make it through to Q3 on the soft tyre, thereby avoiding having to start the race on the delicate supersoft rubber. Though both Williams, Force India, Ferrari, and Mercedes drivers set their first laps on the middle compound, only the Mercedes cars and Sebastian Vettel persisted after the others set times at risk of being usurped by supersoft-shod midfield rivals. Nico Rosberg, however, was forced to attempt a second lap on a new set of softs, his pace painfully slower than his teammate’s best time — but the championship leader suffered two woeful opening sectors and abandoned the lap. Both McLaren cars were eliminated in the second runs, with Fernando Alonso in P11 and Jenson Button in P13 split by home hero Sergio Perez, who locked up on his flying lap, opening a 0.6-second gap to his Q3-bound Force India teammate. Kevin Magnussen qualified fourteenth-fastest, ahead of Sauber’s Marcus Ericsson and Manor’s Pascal Wehrlein. Jolyon Palmer’s qualifying ended before it had a chance to begin; the Englishman’s car developed a crack in its chassis, necessitating a rebuild the team couldn’t complete quickly enough after free practice three to enter him into the session. The Renault stranded at the back of the grid gave one of the sport’s traditional backmarker teams a free pass into Q2 with one of its cars. However, the lack of grip on offer at the one-year-old Mexico City circuit presented a curve ball few teams managed to master. Only both Haas cars were caught out in Q3. Esteban Gutierrez, who qualified P17, spun his car on his final qualifying lap, ironically obstructing teammate Romain Grosjean’s last attempt to make it through to Q2 in the process, relegating the Frenchman to 21st. Between the unfortunate teammates qualified Toro Rosso’s Daniil Kvyat, Sauber’s Felipe Nasr, and Manor’s Esteban Ocon, each of whom were forced to watch their teammates progress to the top 16.